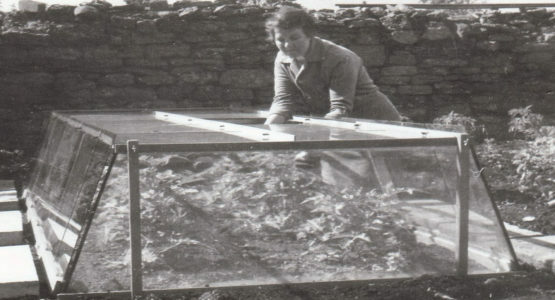 2018 marks our 60th anniversary, with the original Cold Frames sold in 1958. 2018 marks the 60th anniversary of Access, which is a real milestone for any company. In fact, like many businesses, Access began almost by accident. Mr Graham Pearce, an industrial chemist, decided to trade industry for the ‘good life’ and started his own smallholding in Crick, Northamptonshire. After acquiring some additional land, and moving the public right of way, he set to work producing Strawberries. To try and get the Strawberries to market earlier, and get a higher price, he started designing Cold Frames. As the Strawberries needed to be cropped as soon as they were ripe, easy access into the frame was a priority. Unfortunately, the soil in Crick was very light and sandy, affecting yields. When he consulted the local ADAS adviser about the issue, he was told to forget about the Strawberries and to pursue his innovative Cold Frames! This he did, with the small holding gradually being turned over to production work. The first factory was an old Nissan hut that had to be shared with the chickens! The first models were manufactured from galvanised steel and horticultural glass and only one size was available – 10′ x 4′. 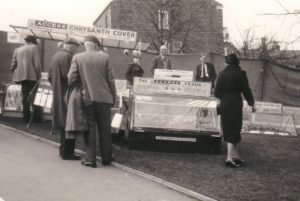 Sales were mainly to commercial growers who, in the days before the polythene tunnel, covered their fields with the frames to produce early crops. If a customer ordered several Cold Frames they were stacked, fully assembled, on the roof of the car! Orders came from far and wide and the RHS at Wisley had 70′ long runs at their trials department. Early on, attempts were made to sell to the keen gardener as well. The first show that the company attended was Harrogate Flower Show, a show the company still attends! Miners, who grew for competition were especially valued customers, often producing large wads of cash with which to pay for their purchases! Often the miners would forgo holidays away from home so that they could tend their prize vegetables or flowers. The ventilation on the Cold Frame was superb, with the roof and the side glass able to be slid open or completely removed. Watering, however, was more difficult, so Mr Pearce used his R&D skills to design irrigation systems for the frames, designing his own sprinkler nozzles. These added greatly to the efficiency of the frames. In the process of time the polythene tunnel was invented, reducing sales to the commercial growers. However these tunnels also needed to be watered, so the company formed Access Irrigation to sell irrigation equipment to these growers. Gradually the range began to increase, with a 4ft x 4ft model launched for smaller gardens, then a 4ft x 2ft model. In the early 1980’s a lady contacted Graham’s son, Donald, to ask if he could make a small frame for flat – she only had a 2ft wide border, but had plenty of wall space if we could make something taller. Don obliged, adding in some shelves to make the most of the extra height. He was so pleased with the result that the Mini greenhouse was launched at Chelsea Flower show. It became an instant success, in fact today most of the models sold are taller models with shelves for holding seed trays and plant pots. In 2012, to celebrate 50 years of attending Chelsea Flower Show, Access launched the Growhouse. 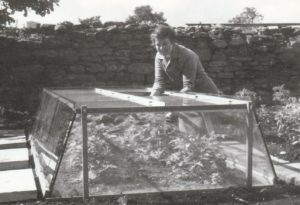 Based on the existing lean-to models, the Growhouse had a glass back, allowing it to be placed anywhere in the garden. Again, it was an instant success and was a finalist in the prestigious ‘Product of the Year’ award at Chelsea. Although celebrating our 60th anniversary is a significant milestone, the company is looking forward as well as backward. More products are planned and investment is being made in equipment to make the company fit for the future. Access recently completed it’s ISO 9001:2018 accreditation process, demonstrating a commitment to quality and efficiency.